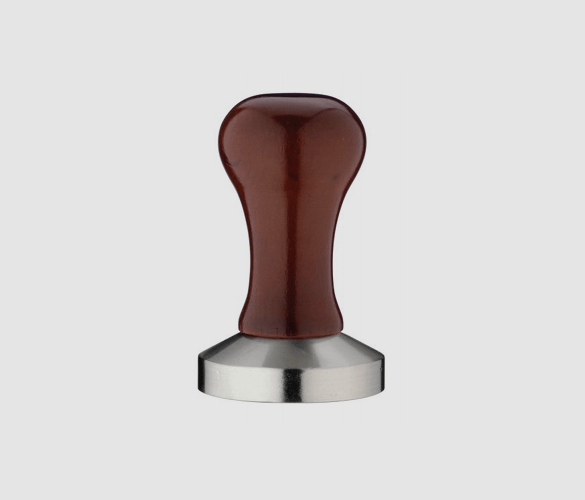 Coffee Tamper Wood – 57mm & 53mm. What does a coffee tamper do and why do I need one? A tamper is the device you see baristas press into the portafilter before twisting them into an espresso machine. They are a hand-held device which have a handle to grip and a circular base to press into the coffee grounds. They tightly compress the coffee into what’s called a ‘puck’. Firstly, when the grounds are initially poured into the portafilter, they usually take up the whole space and leave very little room between the top. A tamper is used to press the coffee down and leave enough space between the grounds and the top of the device. This is to allow the water to pour through the machine smoothly and allow the coffee to expand when it comes into contact with the water. Secondly, it creates an even extraction. If the grounds aren’t compressed, the water will go through at an uneven pressure, speed and direction. By compressing the coffee, the grounds are uniform and forces the water to travel through evenly. This allows all of the flavours to be absorbed and transferred into your mug. Which coffee tamper is best? There are many different materials, shapes, sizes and designs to choose from when it comes to buying a tamper. It creates an ultra-smooth and flat surface on the grounds. It is easy to clean and maintain a high level of hygiene. It is a strong, resilient material which will last through many shifts in even the busiest coffee shops. It has a simple, stylish and elegant design that will look great in any kitchen. There are plenty of tampers on the market which have stainless steel handles, however this product has a wooden component. This allows for an easy and firm grip and also gives an aesthetically pleasing rustic look. What is the right coffee tamper for me and how do I use one? Over time, it is possible to develop strain injuries from using an unsuitable tamper. The correct position when using this device should be your elbow bent at a 90 degree angle and your wrist should be perfectly straight. The pressure should be felt in shoulder. If you feel strain on your wrist, this could result in an injury. When it comes to selecting the perfect device for you, we recommend investing in product that is made from high quality materials. Benefit from this nicely weighted product that gives the perfect tamp every time. Choose from 53mm and 57mm. Always measure your portafilter before purchasing to make sure it will fit smoothly.